The Kenyan Presidential election has been won by a coalition led by Uhuru Kenyatta, with just over 50 per cent of the vote in the first round. His nearest rival was Raila Odinga who got a little over 43 per cent. The victory was despite strong opposition from US and British imperialism. Various speakers on behalf of both powers initially supported calls to move to a second round of voting despite the obvious fact that Uhuru could not be defeated. (Both candidates are known throughout Kenya by their first names, to distinguish them from their famous fathers, the first President and Vice President of an independent Kenya, Jomo Kenyatta and Odinga Odinga). The election was held against the backdrop of indictments from the International Criminal Court for inciting violence in the previous presidential election held in 2007 that had been issued against a number of politicians, civil servants and others. Among those indicted were both Uhuru and his former rival and current Vice President-elect William Ruto. The Western powers have long used the ICC as a vehicle to intervene to influence or determine the political leadership of other states. The indictments relate to the large scale violence that took place after the 2007 vote leading to 1,200 dead and hundreds of thousands made homeless – many still waiting to be rehoused. But the indictments were not prepared until 2010 and then not pursued until the run-in to these elections. These were then used as an excuse for the US to intervene in the election to try to determine its outcome. The veiled Western threats in this year’s election were a more or less blatant attempt to ensure the election of Raila Odinga, who is seen as more supportive of Western interests. Various European governments also warned that they would find it ‘difficult’ to work with a President under indictment at the ICC. In response, the Kenyatta-led coalition warned against a build-up of British troop movements in Kenya and complained of ‘shadowy, suspicious and rather animated involvement’ by British officials just before the poll. The nature of US and British ‘business’ in Kenya is overwhelmingly military. The US has recently increased its forces in Kenya, including the ‘Dagger Brigade’, a part of US strategic Africa command AFRICOM. British troop rotation in Kenya amounts to around 10,000 service personnel each year. Until recently this has been part of the training schedules before troops are deployed in Afghanistan as well as a base for direct military interventions into neighbouring countries, especially Somalia. But increased Western military intervention in Africa means the military presence is likely to step up alongside a rise in the number and type of operations. So the security of Kenya as a military base for the US and Britain has become a more important issue. 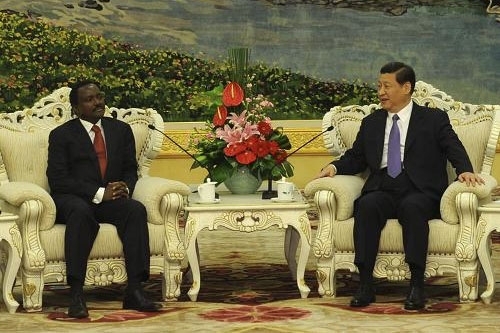 Like other African leaders his options have been increased by a growing trading relationship with China. Kenya’s trade with China has increased four-fold in the last six years, and has recently outstripped Britain and the US combined. Chinese aid has taken the form of large infrastructure projects which cannot be siphoned to US or Swiss bank accounts – which rampant corruption often led to in the past – and direct investment includes new factories producing telecoms equipment and even small-scale car production. The West has never invested in this sort of infrastructure development anywhere in Africa – and now no longer has the resources to offer it. However, they are concerned about the strategic strengthening of China in Africa, and its consequence, much greater independence of African countries from the West. The long term consequences of this for its global military operations and the maintenance of a military presence in East Africa are its priority. It therefore looks for pliant governments that will not accept Chinese investment that does not have Western approval. That is why the most pro-Western, pro-neoliberal forces in Africa constantly intervene to undermine the relations between China and Africa. For example, Sanusi, governor of the central bank of Nigeria, and darling of Western banking circles, argued this week for Africa to drop its ‘rosy’ view of Chinese investment and treat it as a competitor. The Western opposition to Uhuru – and the crime they are really seeking to punish – is due to his avowal to take up the option of increased trade with China, whatever the Western view. It seems likely that, having failed to prevent Uhuru winning, both Britain and the US will now increase the threat of ICC to make him more pliant. And the relationship with Kenya is likely to become more militarised. However as the FT article referenced above noted, the continued British and US interference is gradually stoking growing anti-western sentiment in traditionally pliant and pro-Western Kenya.